My bountiful sweet peas are enjoying a bit of celebrity. They continue to grow taller, fuller, and more fragrant by the day, attracting comments from neighbors and friends. I had a chuckle the other day when my petite neighbor passed the house on the sidewalk, momentarily disappearing behind the tall vines. When she reemerged on the other side I smiled. Who knew that a garden overflowing with delicate and fragrant flowers could be so uplifting? If I were still ten-years-old I would build a fort in the middle of the sweet peas. There would be a secret entrance and everything. As it is, I can no longer reach the center of the garden, where a few tall weeds are thumbing their nose at me. 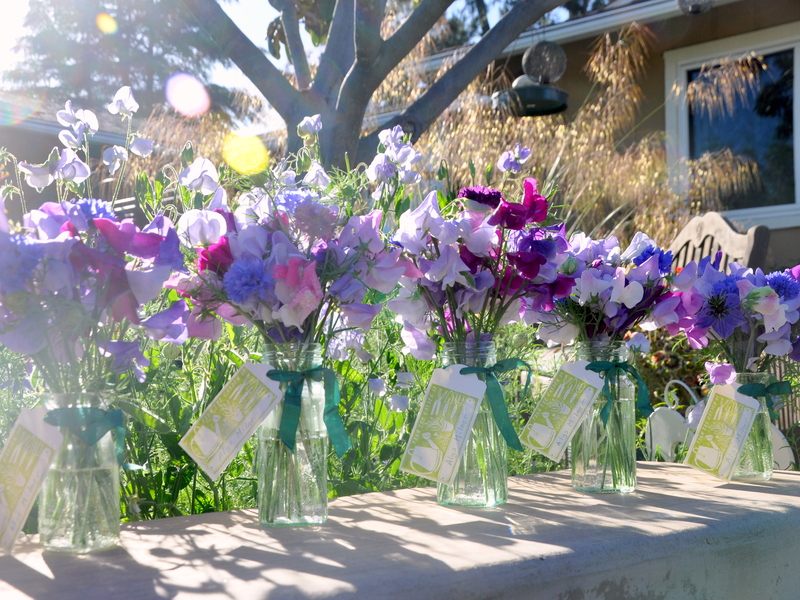 Since returning from my travels, I’ve cut sweet peas for a friend’s birthday and as a thinking-of-you posy. Today I took small jars of flowers to my Pilates classmates. I’ve filled bottles and jars with the sweet blooms, accompanied by cornflowers and Nigella buds for a bit of greenery. This is the first time I’ve used my “From the Garden Of” stamp. It came in a small box with a green stamp pad and a small, green pencil. It’s Teacher Appreciation Week, so a neighbor asked if she could cut some flowers for her son’s teacher. It’s wonderful sharing the bounty. I chased a bee with my camera, but to no avail. He had places to go, flowers to pollinate. The original starter seeds were a gift from my friend Kelly. She thoughtfully included purple so that my sister Sharon could also enjoy them when she came for a visit. I’d never planted sweet peas before so I made a novice move and planted them in the spring. The plants fizzled, so Kelly and I surmised that they didn’t like the conditions in San Jose. 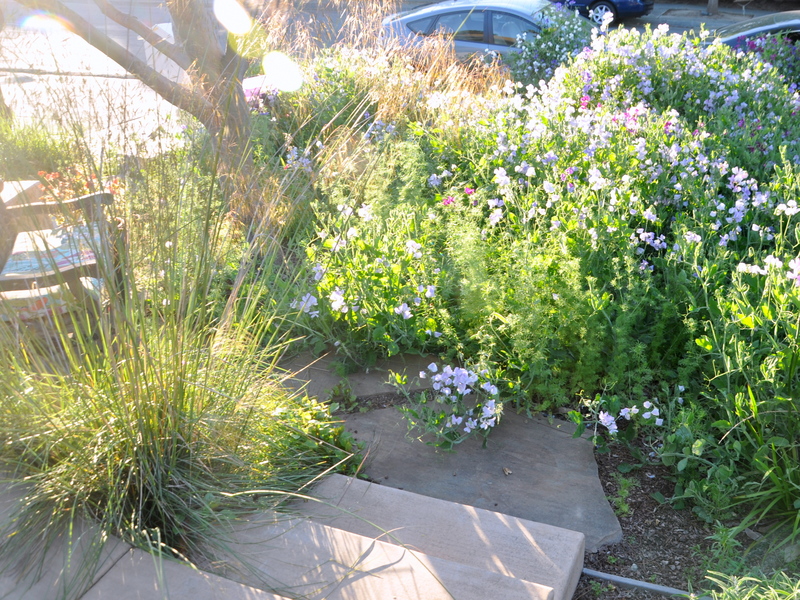 Eventually we let the front lawn die off and replaced the area with native and drought tolerant plants. As far as I can tell, the process of turning the soil in the fall, followed by a generous helping of rain awakened the seeds. They spread all over the garden, jumping the sidewalk and making a run for the street. It’s hard to convey the joy I get from this garden. The sweet peas won’t last through the summer. One major heat wave will be their undoing. 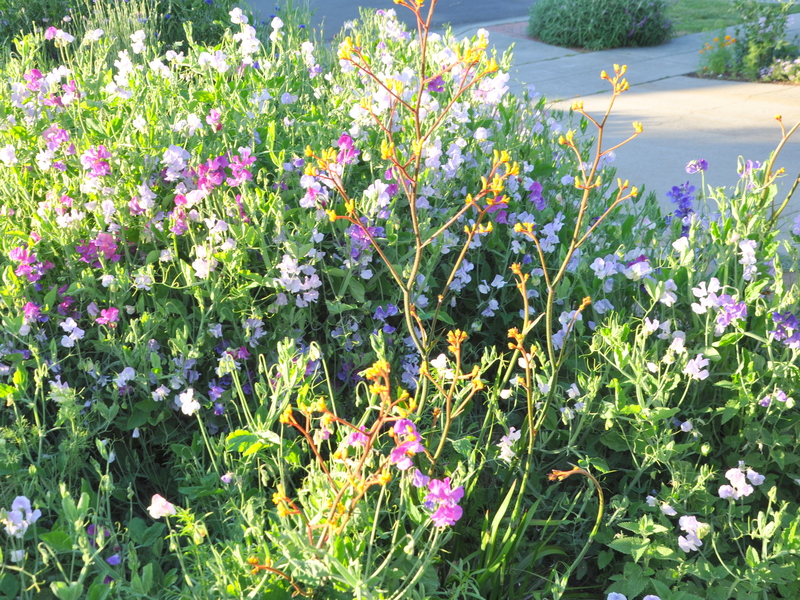 My Canadian friends can keep them going for the summer, but in semi-arid San Jose, the flowers wilt in the heat like me. Knowing this makes them all the more sweet. The last two days have been insufferably hot in the Bay Area. We’re within three degrees of breaking a heat record for this time of year with 87 F (31C) predicted in San Jose. Fortunately the weather is cooling off by the weekend so we can sleep comfortably once again. I hope this week’s heat won’t send my sweet peas packing. Last year’s crop lasted through June. I’m working hard at living in the moment, remaining mindful, while enjoying that subtle fragrance wafting through the evening air. 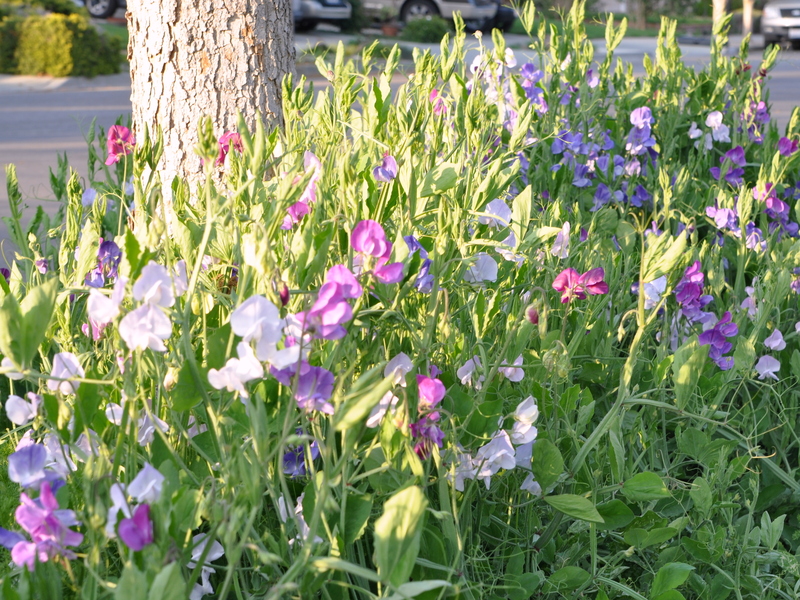 This entry was posted in Gardening and tagged gardening in san jose, growing sweet peas, spring garden, sweet peas. Bookmark the permalink. Lynn, I’m glad your senses are in overdrive. Isn’t it fun the way we can almost will a scent once we know it. They’re powerful. I’m enjoying the bounty while it lasts and I’m having fun spreading the gift. Oh my, what a glorious show! No wonder words cannot describe the joy that your garden gives you – it does me, and I’m just looking at photos! It must have been such a disappointment when the seeds appeared to have failed, and all the sweeter when they started to spring up everywhere. What a wonderful idea for the garden stamps. 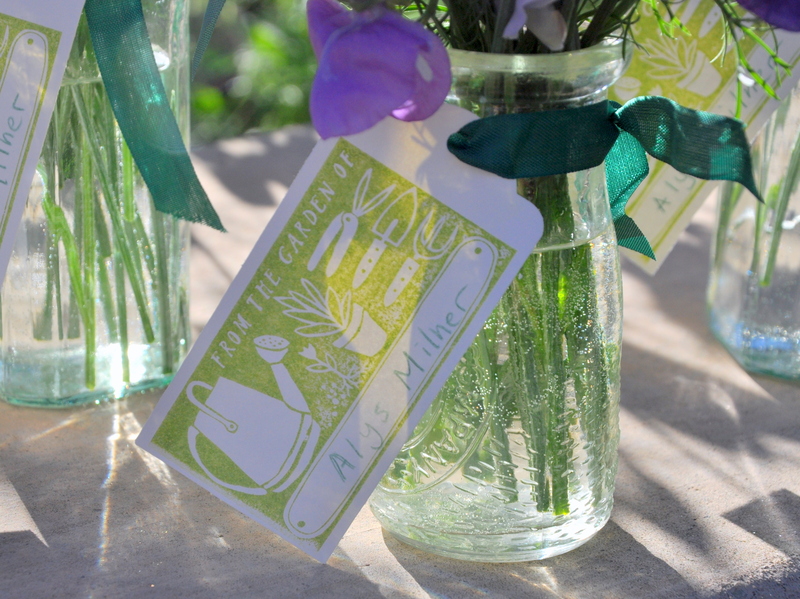 The tags look perfect on the jars of sweet peas. Thank you, Sheila. You’ve described it exactly, one part disappointment and now a thousand times joy. I like to sit out there in the morning for a few minutes with my tea and quietly take it all in. The bees are out, the birds are singing, and the air is still cool. I’m having a lot of fun with that garden stamp. I think I’ll get a small set of watercolors and experiment adding color here or there. It’s a sweet pea explosion! They are so lovely–all that variety of color–and your gifts to others must make a lot of people very happy! Will they self-seed and come back next year? Kerry, yes they will self-seed once again. Last year I waited till they were good and brown before pulling out the last of them. It was hard for this neat-nick but it paid off. I saved a bunch of seeds, but I needn’t have bothered. I’m going to do the same this year, but I’ll give them away in greater number. It’s been fun to see the different colors emerging as well. It’s a joyful experience. Oh, Kate, shocking pink! That must have been something. I’m sorry to hear you can’t grow them in your present home, but I imagine one of the joys of living in so many places is that you’ve been able to experiment with different gardens. What is our favorite flower to grow now? That’s a nice list. I don’t know shell ginger or petrea so I’m going to look those up. I have a star jasmine in my side yard which intoxicates for a few weeks each year. Petrea is very strong and invasive, but I so love the papery flowers. You can hack it back and it just keeps giving! Oh, I’ve just looked it up.What a gorgeous color and texture. Isn’t it! And it’s a very decorative curly creeper, too, if you have a structure to cover. “I can no longer reach the center of the garden, where a few tall weeds are thumbing their nose at me.” Hahahaaa! Congratulations just the same on your beautiful, bountiful sweet peas. I do hope they will weather the coming heat wave and that you will enjoy their fragrance and soft color for weeks to come yet. I’m glad that made you smile. Day three is drawing to a close, and not only is it hot, we have a spare-the-air day. Ugh. I’m really looking forward to the cooling off that arrives tomorrow. I should go whisper to the flowers that everything will be okay. And how are you feeling today? Any improvements? It’s so hard to be injured and have to sit it out. PS: I love your “from the garden of” stamp. What a lovely idea! Did you make the stamp? 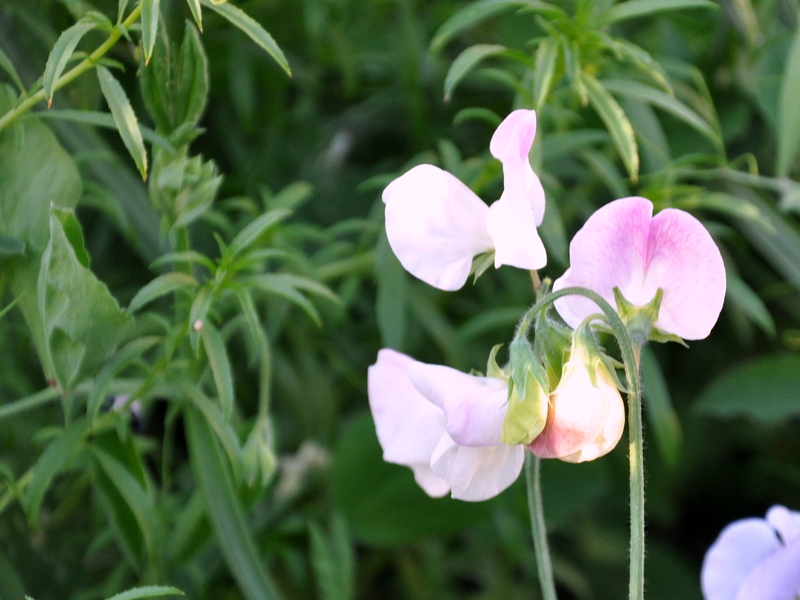 Oh I love sweet peas – I had them for my wedding flowers the scent was so heady. Ours won’t be out for a few weeks yet over here – they are a middle of the summer flower. I wish I could walk past your sweet pea garden and see it for myself in all its glory. Oh, how I wish I had that talent. No, I bought it in a cute shop in nearby Campbell. I planned to use it when I give away seeds, and then it occurred to me that I could use it on the flower vases as well. I love an excuse to haul out my craft supplies. Do you have sweet peas planted in Scotland and at home? They truly epitomize the classic English garden. I usually plant them here at home as the garden here is more sheltered – they are not much of a woodland or coastal plant so haven’t tried them in the cottage garden in Scotland – I think the wild leeks might just over crowd them!! How nice to have two different gardens to plan for. It sounds like a lot of work, but at the same time, quite wonderful. Your bouquets are really pretty!!! Thank you, Cathy. It’s been an amazing spring after the heavy rains. I saw a photo of the sweet peas from this time last year and they were not nearly this tall. It’s quite remarkable. You know, with so many cats, the mice seem to stay away, though we do have plenty of rats. It never occurred to me that they might eat them. Of course I have an orange tree that feeds half the neighborhood (squirrels, opossums, rats) so perhaps they prefer citrus to sweet flowers. Are you growing anything new this year? I am growing Abutilon (Flowering Maple?) for pots again after having some lovely ones several years ago. And I have sown some other new things too, such as pink Cleome and Cosmos. I love them both and hope the snails will give me some respite this year! Today I planted up some summer pots, interrupted by a heavy rain and hail shower! I am just so impatient I put my raincoat and cap on and carried on! LOL! They have so many different names. We have some orange ones growing along the fence. The hummingbirds love them. And now I’ve looked up Cleome and fell instantly in love. What an intriguing flower. Good for you for carrying on, rain or no rain. I would have done the same thing. Cleome is called ‘spider flower’ in German, and I think that is quite apt with the spiky, spindly leaves and seedpods. 🙂 I wonder if you could grow it. Wish I could send seeds to the US! I wish it was easier to send seeds, too, but I do understand why they restrict it. So many invasive species of plants and animals were spread around the world by unknowing people. We’re still trying to “right” some of those wrongs. Thanks for thinking of me, though. I’ll look them up. The sweet peas are gorgeous! 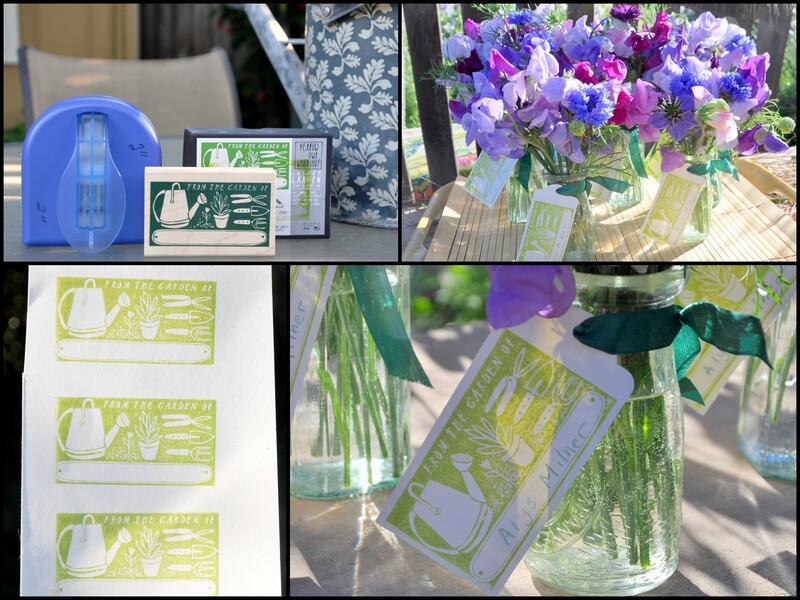 I love the (from the garden of) stamp, what a great idea! How fun to receive one of the bouquets in the last picture. You really have a lovely garden. Thank you, Karen. They bring me such pleasure. Perhaps that comes from my English roots. It’s nice to have an abundance so I can share them with others. I wish I could send some to you. Was that you? Oh you big tease. How I wish it were so. I remember your sweet peas growing along that side fence when I was there last summer. What a lovely garden you have. Our Fremont garden had a similar set up where we pulled the cars into a long driveway, then parked behind the house and small garden/deck. I loved that. In Willow Glen the garages are usually in the back, but in these 1960s homes, they’re all out front. 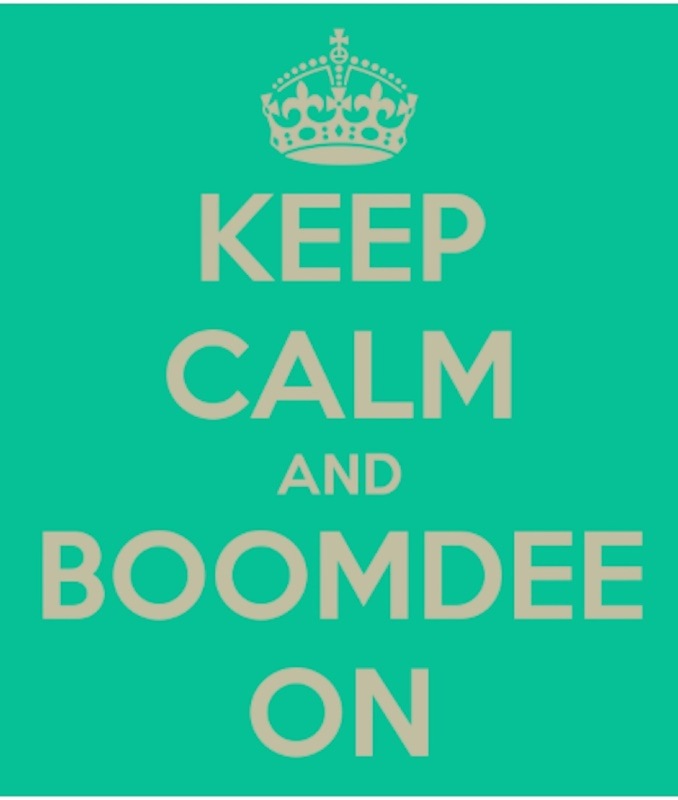 I’m glad to hear that you’ll finally get some spring cleaning weather and time to plant your seeds. What’s are your planting this year? I still need to plant the corn seeds I bought, and some sunflowers too if I can find room. I planted a few summer bulbs this year, too, so we’ll see what happens. I grew lilies and gladiolas several years ago. The glads did not survive past a year, and I stopped growing lilies after a friend told me they can be toxic to cats (though the type may vary). It would be so sad for me to move and learn that someone had upturned the entire garden. I’m sorry you have to contend with that thought. So many years of blood, sweat, and tears. Painful stuff. Marlene, do you always get up at 5:30? Or are you up early to avoid the heat? My son has a 7 am class so we’re up at 6:20 and that is hard enough. I’m glad you like the little jars of flowers. I wish I could deliver one to you. My Nigella came up slower this year, but it sprouted pretty early. The buds are just starting to open. I hope you get some when it dries out a bit more. 5:30 if I sleep in. I like the quiet before the world wakes. No alarm clocks, my body seems to have it’s own. Going up on the hill now before it’s 83 again. 😦 Have a wonderful day. You too, Marlene. It’s wonderful waking up when your body says so. I’m more of a night owl, who’s been forced to adjust in the past twenty years since having children. I’ve learned to love the early morning hours though, too, and like you and enjoy the quiet. Oh Alys, how lovely it all is. I am soooo jealous. You are very gifted. I am trying to put a little post for you in messageing on FB but my week has been quite busy and I am not very good at the whole tech thing so please forgive how very long it has taken me to send you a note of thanks for your lovely gift. Julia brought it down Monday night (5/1) and I have been very rude not to let you know I got it. I love the soap and so wish you were here to have some coffee with me. I too melt in the heat. UGH!! One of the things I hate about the east coast is the heat and the humidity. As you know I was born in the desert (Edwards AFB) and raised in CO so a desert girl I remain. I love the fall colors but I hate that we climb to the 80’s in March and stay there until November and suffer some terrible humid days in between. UGH!! Enough complaining. Must go admire your lovely sweet peas again. What a great crop. Enjoy every day and every one. Sweet, sweet stamp too. Amy, you are anything but rude, so please don’t give it another thought. Enjoy that coffee and one day we’ll have a beverage together. I’m a fan of the Cool Lime Refresher’s at Starbucks. 🙂 The desert is hot but dry, quite a change from the humid heat that clings to you and won’t let go. I didn’t realize it went on for so many months. That’s got to be tough. My sweet peas are still going strong and I’m still giving them away to passersby. They seem to be universally loved.